My jaw dropped. I caused sleepless nights to Tom Dine in the 1980s? How about all those sleepless nights he caused me back when I was trying to argue in Washington that Palestinians are people like everyone else and he was the much-feared executive director of the American Israel Public Affairs Committee (AIPAC), who took down the careers of people like me without a second thought? Damascus, with its long tradition of conversions, seems a good place to launch this story. But step back to 1982, when Dine, figuratively speaking, picked up veteran Illinois Representative Paul Findley by the lapels and slammed him against the wall of electoral defeat–to make an example for any other members of Congress who might want to take even a half-step away from AIPAC’s rigidly pro-Israel orthodoxy. (Four years earlier, Findley had met twice with PLO leader Yasir Arafat, eliciting from him a statement that offered guarded support for a two-state solution and, according to Findley, “de facto recognition” of Israel.) Dine was also the man who, as he told me recently, spent many Saturday mornings sitting with Secretary of State George Shultz, conferring closely–no aides present–on key aspects of US Middle East policy, especially arms sales. Today AIPAC is just as much a powerhouse lobby as it was during Dine’s thirteen-year reign, but it is much more pro-Likud than it was back then. And it is still working hard to drum up opposition to Syria. Dine left AIPAC in 1993 and has moved noticeably toward the peace camp since then. Recently he worked with the broadly dovish Israel Policy Forum (IPF), which advocates a two-state solution between Israel and the Palestinians. And for the past year, Dine has been heading a small group dedicated to improving US-Syrian relations. Dine has taken a long journey, from drinking Scotch one-on-one with Yitzhak Rabin in Jerusalem’s King David Hotel–at a time when Rabin, as defense minister, was calling publicly for his soldiers to “break the bones” of unarmed Palestinians during the first intifada–to caucusing with well-connected Syrians in Damascus, two decades later. Tom Dine was born in 1940 in Cincinnati, a city perched on the edge of the Old South. He told me he hated racial discrimination from an early age. The Dines were members of the Isaac M. Wise Temple, named for the rabbi who established the founding tenets and institutions of Reform Judaism. For young Reform Jews in 1950s Cincinnati, there were no bar or bat mitzvahs; there was “confirmation.” And once Dine was confirmed, he pursued further religious studies at the city’s Wise-founded Hebrew Union College (HUC). At Colgate University, Dine joined the Congress of Racial Equality. Later he served with the Peace Corps in the Philippines, got a master’s degree in South Asian history at UCLA, then took a job at Peace Corps headquarters in Washington. “I got this terrible, terrible disease the moment I got off the plane there: it’s called Potomac Fever. I never got over it!” he said. In Washington he met Joan Corbett, daughter of a prominent Unitarian family in Portland, Oregon, and soon thereafter they married. They spent two years in New Delhi, where Dine was assistant to US Ambassador Chester Bowles. After returning to Washington, Dine worked five years for Senator Frank Church, four years on the Senate Foreign Relations Committee under Edmund Muskie and one year with Ted Kennedy. “With Ted Kennedy, I was ostensibly doing defense policy, but really I was orchestrating his Jewish-vote efforts,” he said. The effects of Dine’s campaign to stimulate Jewish participation in US political life were soon felt throughout the land. Findley was not the only legislator who, having crossed some AIPAC red line, suddenly found an opponent awash in funding mobilized through Dine’s nationwide network of donors. After Findley lost his re-election bid in 1982, he published They Dare to Speak Out: People and Institutions Confront Israel’s Lobby. The book tracks campaigns AIPAC waged in the early 1980s that Findley thought helped defeat other Congressional candidates, people like Charles Percy and Adlai Stevenson III. AIPAC’s greatest strength, friends and foes agree, lies at the Congressional district level. There its organizers deploy networks of committed Israel supporters who build early relationships with up-and-coming political figures and keep close tabs on actions and attitudes regarding AIPAC’s concerns. The headquarters aids that process by distributing timely bursts of information on how each legislator has voted on matters of interest to AIPAC. In 1982 Dine hired M.J. Rosenberg to be a key distributor of that information by editing the biweekly Near East Report, which AIPAC sent out to members and supporters. Rosenberg has also long since departed from AIPAC and moved to the left, and to a greater extent than Dine. He disputes the notion that AIPAC’s disfavor has ever been the decisive factor in taking down Congressional candidates. “There were cases, like Cynthia McKinney, where the candidate was already damaged goods, and AIPAC helped push the candidacy over the edge,” Rosenberg said. “But they still don’t dare take down people in good standing in their constituencies, like [Virginia Representative] Jim Moran, even though he does a lot of things AIPAC doesn’t like.” Rosenberg–like, not surprisingly, Dine himself–therefore challenges the argument John Mearsheimer and Stephen Walt have made about the all-prevailing nature of AIPAC’s power in Congress. Bill Clinton’s 1992 victory brought exultation to the pro-Israel community. Clinton had, after all, beaten George H.W. Bush just months after Bush had forced a showdown with Yitzhak Shamir over Israel’s West Bank settlements by threatening to link $10 billion in loan guarantees to Israel’s compliance with a settlement freeze. And Clinton had many pro-Israel advisers. His first National Security Council staff member on Middle East issues was Martin Indyk, a hurriedly naturalized Australian citizen who had been AIPAC’s deputy director of research before leaving in 1985 to found a strongly pro-Israel think tank, the Washington Institute for Near East Policy. In 2007 Dine returned to Washington, where he became a senior policy adviser with the liberal Israel Policy Forum. He also took part in the US-Muslim Engagement Project, which issued a thoughtful bipartisan report in September 2008. In mid-2008 the DC-based nonprofit Search for Common Ground was looking for someone to lead a small, discreet project to improve Washington’s badly frayed relations with Syria. Dine took the job, and has since made four trips to Syria. When he describes his early impressions of Syria, and the well-connected Syrians with whom he works, Dine’s bony face lights up with enthusiasm. “They are so warm. They have so many of the same concerns as us.” When I have seen him with his Syrian counterparts, it seems clear they have built warm working relationships. Improving US-Syrian relations has, however, proven difficult. Syria has been on the State Department’s terrorism list since the late 1970s. In late 2003, when AIPAC’s supporters were still joyous about the overthrow of Saddam Hussein, they persuaded Congress to pass the Syria Accountability Act, which tightened sanctions on Damascus. Two years later President Bush signaled his displeasure at Syria’s alleged (but unproven) involvement in the assassination of former Lebanese Prime Minister Rafiq Hariri by withdrawing the US ambassador. Many Barack Obama supporters hoped that after his inauguration he would act fast to mend ties with Damascus. President Bashar al-Assad’s government is, after all, a key player in Arab-Israeli diplomacy and in restoring stability to Iraq. It has demonstrated its readiness to cooperate with Washington in these two spheres, and in Lebanon as well. In June the administration finally informed Syria it would send an ambassador to Damascus, but months later it still has not named anyone. This relationship–like Obama’s Arab-Israeli diplomacy more broadly–seems stuck in the doldrums. Not even the involvement of the once-feared Tom Dine has been able to free the logjam. Meanwhile, the newer, more liberal kids on the US Jewish lobby block, like IPF and J Street, have shown themselves ready to go much further than Dine in openly challenging the AIPAC orthodoxy–especially on the Palestinian issue. Dine may have worked for IPF, but he still seems reluctant to challenge AIPAC’s hardline approach on Israel-Palestine. I asked him a couple of times whether he thought Obama should push the Israeli government harder on this front. At one point he cautiously recalled, “There have been episodes along the way when the US used the instruments of its national power to prod Israeli change on peace issues–but not since the days of Bush I and [Secretary of State James] Baker…. And yes, the Bush-Baker policy did help persuade the Israelis to vote for Rabin [against Likud’s Shamir].” But Dine avoided saying whether he thought Obama should engage in a similarly tough-minded pursuit. Another time I asked why he thought solving the Israeli-Palestinian conflict was in America’s interest. Instead of answering, he explained why solving it is in Israel’s interest. The differing attitudes Dine displays toward Palestinians and Syrians seem to spring in good part from the different degree of familiarity this very hands-on, sociable man has with the two peoples. 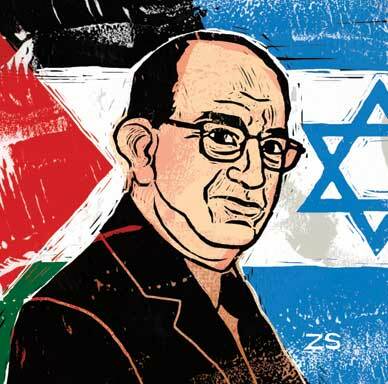 At one point he said bluntly, “I don’t know very many Palestinians.” Surveying the Jewish community more broadly, however, he noted that many more Jewish Americans had gotten to know Palestinian Americans, and other Palestinians, over the past fifteen years than had been the case back when he was head of AIPAC. “So yes, there has been a new level of exchange and understanding.” Dine has not, up till now, gone as far in embodying that new understanding as the more fearless Jewish activists and organizers in J Street and Jewish Voice for Peace. But he–like many other Americans–has traveled a long way since the 1980s. For many, perhaps including Tom Dine, that journey continues.